Workplace accidents are tragic but when they happen on a farm where family members are involved, there is devastation and a sense of regret that not more was done to prevent them. WARREN MILLS highlights the importance of creating safety consciousness on the family farm. Prevent on-farm tragedy such as tractor or ATV accidents by discussing the importance of safety with your family members. 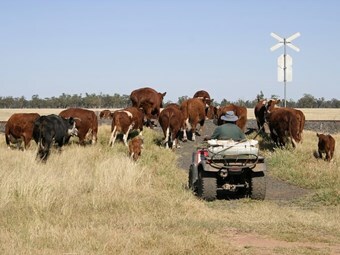 There have been several recent tragic farm accidents involving tractors and older men, plus the tragedies at the other end of the scale involving young people and quad bikes. Any workplace accident is a tragedy, but many farm accidents involve family members, where apart from injury or death, there is regret that the family did not do more to prevent the accident. This is always difficult. In a business relationship, the emotional aspect is usually less than within a family. It is possible to make compliance with safety rules a condition of employment on the basis of respective legal duties. The threat of dismissal for non-compliance with risk controls within a family is not a realistic threat in most cases where emotion or seniority in the family takes precedence. However, emotional restraints count for nothing if a family member is killed as a result of a foolhardy action that would not have been otherwise permitted of an employee. "Dad wouldn’t take any notice when we told him not to go out on the tractor by himself. He said he had been doing it all his life, and he is not going to stop now, just because we are nagging him". I remember a similar situation when my ageing father-in-law would frequently have small accidents in his car and drive up tram tracks because he was confused. His wife was convinced it was a conspiracy against them to rob them of their freedom, and the opinions expressed by family members did more harm than good when the doctor finally told us that he could not drive any more. It is a similar story with young people who don’t want to be told when, where or with whom they can ride a quad or motorbike. The emotional arguments become overheated and the opportunity for a rational discussion is lost. Regardless of the difficulty with emotional arguments, nobody would argue there was nothing that could have been done after the fact, when regret that more could have been done is the bitter taste that remains. I imagine all of us can think back to dumb risks we have taken and gotten away with in the past. With the benefit of hindsight, there are many things that we might wish we had done differently. My experience as a workplace safety trainer for the past 20 years suggests that we all need to look back with gratitude at the situations from which we escaped unscathed. We should use these insights of gratitude to engage our brain to think, "What would I do with what I know now that I am older and wiser?" My suggestion is we should use all the imagination we possess to create safety awareness. My suggestion is to use the Safe Farm System Guide, available from CR Management Systems, and ask all family members to read their copy prior to a family meeting where the relevant issues are discussed and some agreements made. Of course, that won’t be a complete answer, but it is a beginning that may have a positive impact, rather than an impact you may live to regret. Warren Mills is the managing director of CR Management Systems - a specialist supplier of OHS compliance systems for farm machinery dealers. He can be contacted on 0419 239 877 or warren.m@crms.com.au.